Q: WHAT IS THE DIFFERENCE BETWEEN A LANGUAGE AND A DIALECT? This saying, long part of oral tradition among sociolinguists, was quoted in a review by Alan Kaye in _LiS_ 26:484 (1996). In his manuscript, Kaye had attributed the quote to Max Weinreich; the editor of this journal changed the attribution to his son Uriel Weinreich [from whom I first heard it in 1957 -- WB]. (a) However, it has also been attributed to Joshua Fishman. Weinreich is often cited as the author of a criterion for distinguishing between languages and dialects: "A language is a dialect with an army and navy" ("אַ שפראַך איז אַ דיאַלעקט מיט אַן אַרמײ און פֿלאָט", "a shprakh iz a dialekt mit an armey un flot"), but he was explicitly quoting an auditor at one of his lectures. Source of Max Weinreich's saying that A shprakh iz a diyalekt mit an armey un a flot ['A language is a dialect with an army and a navy.'] 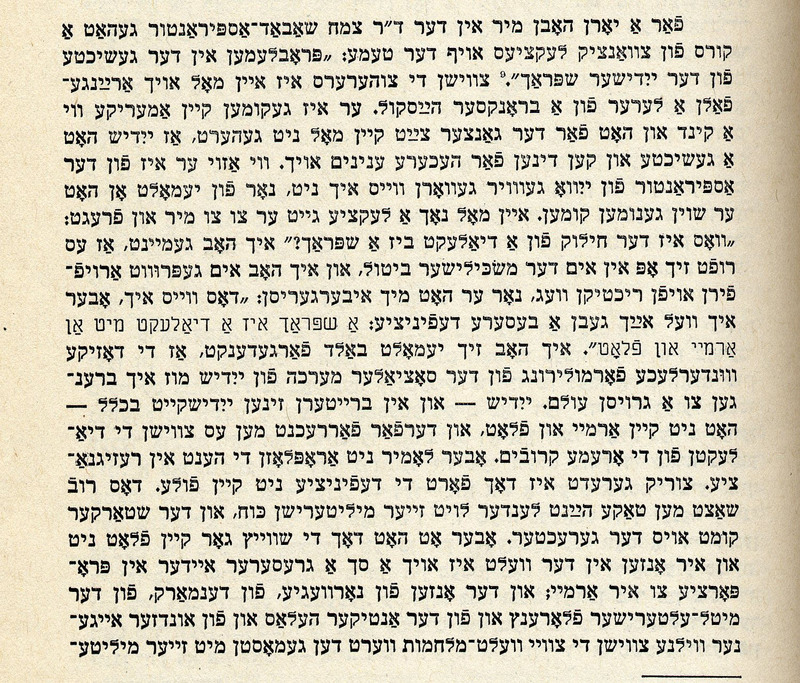 <BIG PIC> is found in Weinreich's "YIVO and the problems of our time," _Yivo-bleter_, 1945, vol. 25, no. 1, p. 13. Weinreich attributes this formulation to a young man who came to his lectures, and he decided, "I must bring to a large audience this wonderful formulation of the social fate of Yiddish." Congratulations to our good friend Novershtern and to all Mendele-subscribers who helped look for the largely forgotten source of a famous saying that is relevant to Yiddish and to all "one-down" languages. "The attribution of the army-navy statement to Joshua Fishman is unlikely to be correct. In his 1945 article, Max Weinreich says that his informant immigrated to the USA as a child. Since Prof. Fishman was born there, he does not fit that part of the description. He was also no older than 18 at the time and in school elsewhere, thus not likely to be a teacher at a Bronx high school. Finally, the unnamed source of the saying knew little about the history and linguistic status of Yiddish. Joshua Fishman's knowledge of both was already significant.